The new Focus ST makes its global debut today at the Goodwood Festival of Speed, U.K. – the ideal location to showcase the speed and enhanced driving dynamics of the global performance car. The most advanced Focus ST yet offers new chassis control technologies, tuned suspension and steering, and bespoke tyre specification that ensure an even more responsive, balanced and refined driving experience. 6 percent and making it the most fuel-efficient petrol Focus ST ever. Ford’s 2.0-litre EcoBoost engine uses turbocharging, Twin-independent Variable Cam Timing technology, and high-pressure direct-injection to deliver uncompromising performance. Peak power is available at 5,500 rpm, 360 Nm of torque is available from 2,000-4,500 rpm, and maximum speed is 248 km/h (154 mph). The six-speed manual transmission offers a performance-oriented, short-throw shift. The gear ratios – exclusive to ST – deliver rapid acceleration in lower gears and comfortable cruising at speed. “The new Focus ST delivers an even more sophisticated balance of performance, driving dynamics, refinement and style – the core of Ford’s Sports Technologies DNA,” said Joe Bakaj, vice president, Product Development, Ford of Europe. 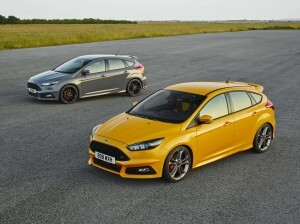 The Focus ST also will benefit from technology and craftsmanship first revealed earlier this year for the new Ford Focus – the world’s best-selling global nameplate. ** The sporty and aggressive new five-door model will offer class-leading driver assistance technologies and connectivity features including the SYNC 2 in-car connectivity system.